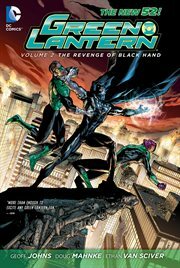 The item Green Lantern, Volume 2, Revenge of the black hand, written by Geoff Johns ; illustrated by Jim Calafiore, (electronic resource) represents a specific, individual, material embodiment of a distinct intellectual or artistic creation found in Austin Public Library. Comics hottest writer Geoff Johns (Justice League, Aquaman, Blackest Night, Green Lantern, The Flash) joins artist Doug Mahnke to on one of DC Comics-The New 52's hottest titles, Green Lantern! After the events of War of the Green Lanterns, the villainous Sinestro is suddenly a Green Lantern, whether he wants to be or not! Now teaming up with his former foe, Hal Jordan, Sinestro find themselves investigating a crime that leads them deep into the homeworld of the Indigo Tribe. As their situation grows more and more dire, the unlikely team of these two Green Lanterns uncovers a secret that will change the GL Corps forever!